The Beef steak … reverse engineered. A few weeks ago my wife and I were blessed with the company of our very dear and old friend Dave. It had been awhile since he’d been here so, we invited him over to break bread with us. I planned a grand feast for him with the centre piece being a big, fat, juicy Strip Loin, slow cooked in a tepid oven and flash seared to finish on a blistering hot cast iron grill pan. Sounds weird I know but let me explain and, … you ‘might’ want to try this ‘happy accident’ I stumbled onto a few years ago for yourselves. A butcher showed up at a friend’s place with a HUGE, 2 1/2 inch thick, full cut Sirloin Steak and planned to use his buddy’s gas BBQ to grill up this behemoth. The grill was fired, the drinking commenced and the monster steak was tucked onto the grill. More drinking ensued, followed by more drinking (you KNOW how these things can go). After a while, the chef (guest butcher) noticed that he wasn’t getting any more than about 225 degrees surface temp from the borrowed grill. Enough drinking had taken place that the urgency to eat this tepid looking, massive steak had been replaced by the need to carry on with the party. 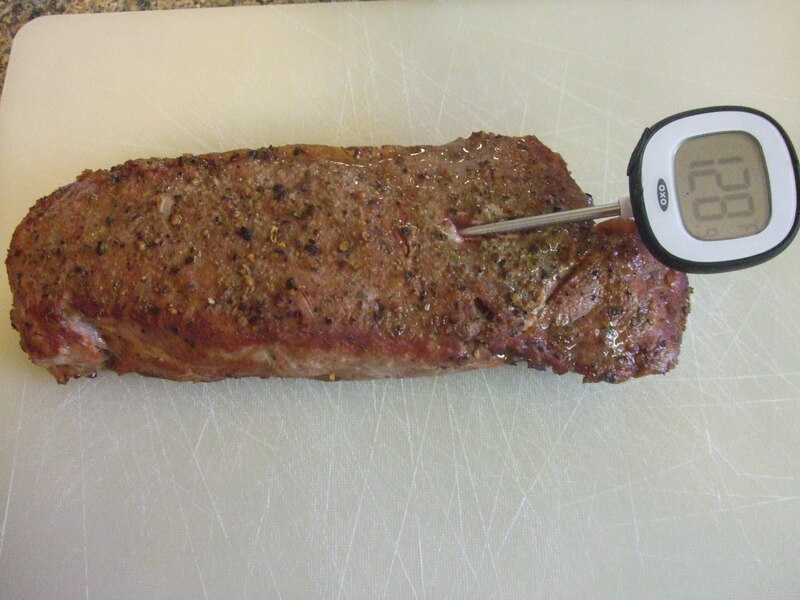 As the story goes, … at some point, a digital read thermometer was produced and he was VERY surprised to see the internal temp was a very respectable medium rare, even though the outside was unappealing and rubbery looking. After searing both sides on the stove in a cracking hot, cast iron grill pan and sliced thinly, the party goers were treated to undoubtedly the best steak they’d ever eaten. I’ve tried this myself a great number of times and have never ceased to be amazed by how well this method works. It’s almost like reverse engineering or, deconstructing a BBQ method since first, you gently bring your meat to the desired internal temperature … then you add the outside ‘char’ using a cast iron grill pan. Not unlike a (click here:) Sous-Vide method only you’re not ‘holding’ the meat at the desired temperature for a long period of time. Start with an awesome steak … your choice. 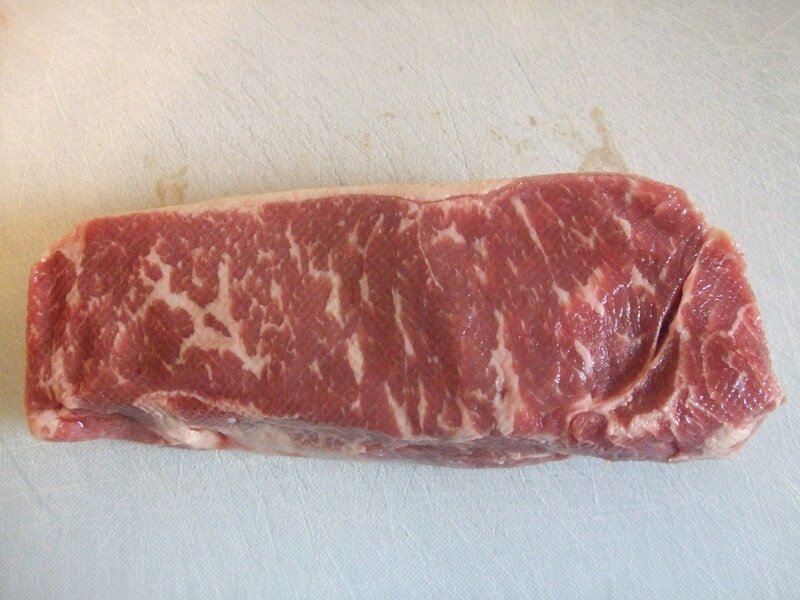 Tonight, I’m using a well marbled New York Strip Loin. Place it on a grill rack and shove it into a 225 degree F. oven and let it go for ten minutes. In a 225 degree oven, bring it to 127 or 128 degrees F. Check the temp OFTEN. After the initial ten minutes, use your thermometer to check your progress. You “should” be around 90 to 100 degrees. From this point forward, check the temperature OFTEN … one or two minutes will mean the difference between medium and medium well. Finish it on a SMOKING HOT cast iron pan to give it a nice sear. 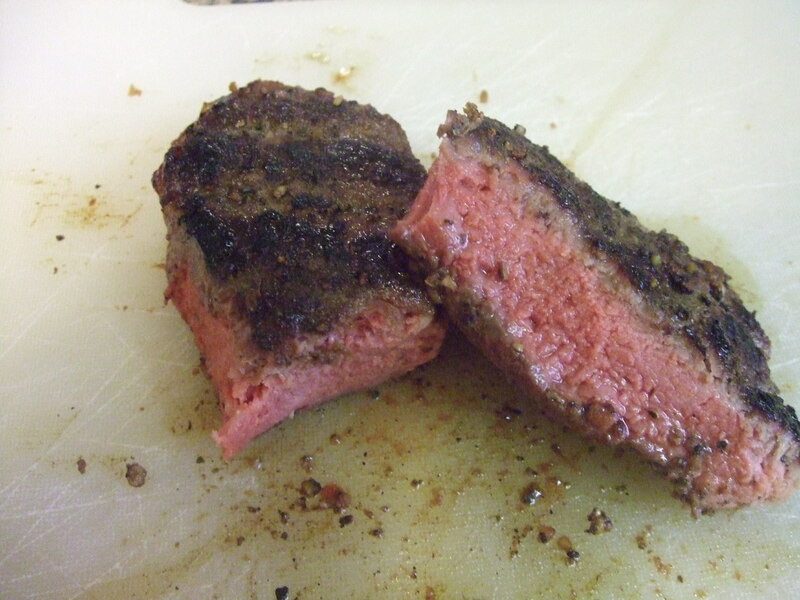 Voila … a reverse engineered steak … done to perfection. Oh man … get ready to taste one AWESOME steak. The total cook time is around 15 to 20 minutes (results will vary), just remember to check the temp with a GOOD thermometer OFTEN. The same method can be used on the BBQ as well … just make sure your heat is indirect and monitored OFTEN. To say that our friend Dave was impressed is an understatement … makes the heart swell up with pride. This entry was posted in BBQ, Beef and tagged BBQ, Beef, Cast Iron pan, Gas grill, grill, New York Strip Loin, Sirloin Steak, slow cooking, Sous-Vide, Steak, Strip loin. Bookmark the permalink. Rib, Prime Rib, Standing Rib, Cap on, Cap off, Chef Style … what does it all mean ??? Today’s Butcher tip … BUY PRIMALS FOLKS !!! Another awesome dinner. Thanks Dougie D. Chef extraordinare!!! Elephant Shoes! Interesting because I’ve heard of this method (not explained so well) yet I’ve always seared first, then baked. 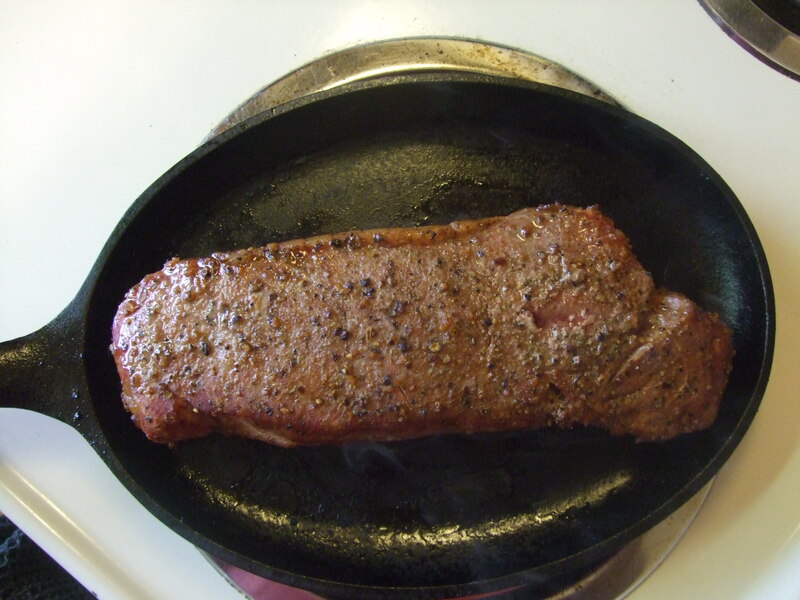 I have a couple small steaks I need to cook, and I think maybe I’ll cook one with your reverse method and one with my old – not that I doubt you, just because I think it would be fun to check it out and see how this works on my “cheap” Aldi steaks! Thanks Frugal 🙂 … once you reach 127-8 degrees, … you’re there. Sear it off and let me know what you think. Being like-minded when it comes to the red meats, I value your suggestions. This looks like a great one! This way, the delicious crustiness of the sear is at its best. Brilliant. I use this method on the grill for thicker steaks, cowboy/tomahawk steaks, tri tip, etc. Perfectly cooked great tasting and the internal temperature and color of the meat is consistent top to bottom. Cheers! Slow cook.. Then flash fry.. It turns out medium? Hmmm.. Different.. I don’t doubt you at all!! That’s how a guy (Christopher) ended up winning last night on MasterChef. And his was accidentally also. mmmmmm…..